Do you find excitement running down percentages and other numeric comparisons on an Excel spreadsheet? How about crunching for a challenge solution from within reported numbers? Actually, many people tend to think BORING when audits, accounting and fiscal reports are on the plate. However, those line items, like paragraphs in a narrative, tell financial gurus how to make a decision. It’s not a debate, often, at a Finance Committee meeting, one or more members of council and the administration dig out their hand calculators to get the requested answer. The numeric calculations foretell the broader decisions --- if the revenues are too low or the expenses too high, the financial data has made the decision. It’s up to council and the administration to find positive approaches to reflect what’s in the numerals. As February approaches, Huntington administrators, department heads and council know what is looming --- a series of in depth usually Saturday morning discussions / hearings on proposals for the next year’s budget. 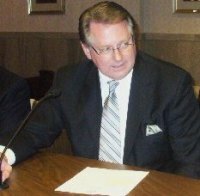 “This will be an exciting, fascinating and confusing” series of council departmental budget hearings, Council Finance Chairman and at-large councilman Steve Williams predicted with the enthusiasm that often precedes an athletic match. He warned that “not paying attention” or “missing any of the sessions” will lead to a state of cluelessness. The former city manager and current banker then translates his numeric approaches into meeting demands for city services --- perhaps, by restoring cutbacks and surely by not increasing fees. But, the budget sessions precede the mid-March state home rule committee meeting. That timing likely, according to Williams, means the preparation of two budgets ---- one that incorporates the tax reforms and one that does not. For instance, Williams believes that two budget documents will be necessary --- one excluding the tax reform revenues and another including the revenues/alterations from the occupation tax and other reforms. He also predicts that the city will meet a challenge and return to a five day work week, as well as provide $600,000 for paving in both the Spring and Fall. Williams has opposed the four day week at Huntington City Hall from its first announcement. Although numbers have demonstrated a savings, he believes the amount marginal. The administration announced the extended four day work week, rolling furloughs and 10% pay cuts to offset a dip in city revenue collections during the deep recession. Calling the Friday closure “ill-conceived,” he recalled his consumer banking managerial experience for a possible solution. Williams knew that on customer heavy days, such as Saturday, the first of the month, or Friday evening, more tellers needed to be on duty to prevent long lines. Under that managerial thesis, he believes the city could re-open Fridays and even add three hours on Saturdays. Slow days of the week would receive less staffing. Considering lowering the requirement for council spending authority from $15,000 to $7,500 “bad policy,” Williams illustrated that under the new restrictions the salt spreader would have arrived on or about January 12, 2011, instead of December 12, 2010, the day of the winter’s largest storm. Negating the need for a lower and more restrictive pre-approval process, Williams points to lessons learned through the council committee procedures that entail a monthly line item accounting. “They are already watching every expenditure they make,” Williams said. When the monthly financial reviews demand line item accountability, the fiscal impact of choosing to purchase one salt spreader for approximately $11,000 amounts to “chunk change,” since the reviews keep council informed of revenue and expenditures before either gets too off target for course corrections. “We were able to find [budgetary issues] even in the Mayor’s office,” Williams said, specifically the accounting formula for the Economic Development Director’s salary…. Another find: The use of $100,000 for street and bridge repairs that came from the paving budget. By locating and discussing the ambiguity, council moved to create a specific line item for paving. As for the 2011 outlook, large and small deals have veils of public release timing. However, he hinted at several major projects heading to Huntington, including two strong possibilities for Kinetic Park and one for the HADCO properties. Editor’s Note: Council’s Finance Committee meets Monday and Tuesday, Jan. 31 and Feb. 1 at 5:30 p.m. this week in City Council chambers. Meetings are open to the public and televised on Comcast Channel 24.